I am a bit out of it today. So instead of any thoughts, they would be incoherent, I’ll share one of my favorite crochet runners. I made this during my thread crochet days, when it seemed there were not enough hours in the day to get everything I wanted done. Now I am more relaxed, and wonder if I’ll ever make anything like this again. I love how the center turns the pattern and the three scallop ends . The runner is about 36″ long. 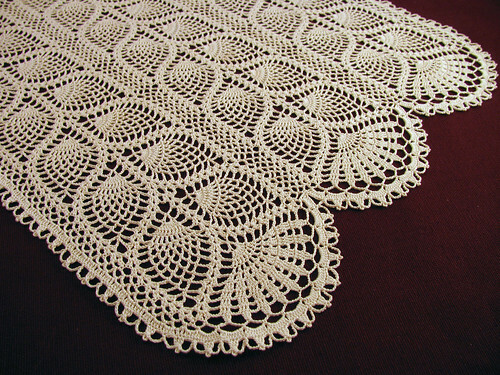 It is made in ecru cotton Cebelia size 3o thread and a size 12 steel crochet hook. It is one of those designs that will work for a holiday table or a spring tea party. In heavier yarn one pattern of the repeat would make a nice lace scarf. The center. If I don’t put words here I don’t get a space between the photos. 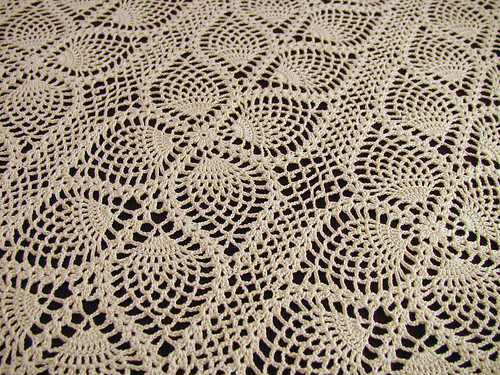 This entry was posted on Thursday, January 15th, 2009 at 3:00 am and is filed under Crochet and Lace. 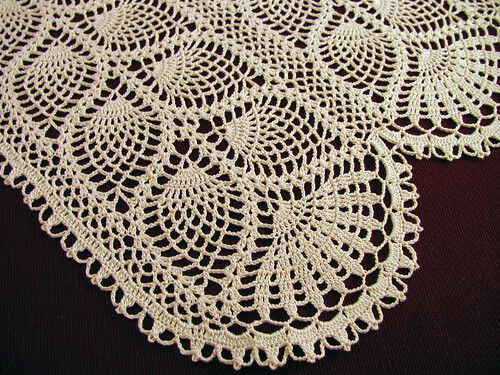 Tagged: Crochet, Lace, Thread. You can feed this entry. You can leave a response, or trackback from your own site. Wow! Gorgeous! I really, really, really like it! What is the pattern?